Despite often being the object of criticism, Millennials have answered the call to end extreme poverty. Millennials get a bad wrap. You’ve probably heard all of the labels: selfish, narcissistic, manic, lazy, over-confident, ambitious. While some of these labels may be true, the generalisation that Millennials are devoid of caring for the collective good of the community and are the generation most likely to be voted off the island for putting themselves first is pretty confronting. You can’t help but feel a little depressed about the future of the planet and humanity, right? So it got me thinking, is it as bad as it seems? Are Millennials the end of the civilised society as we know it? The end of the best times that the previous generations claim are so important that we must desperately hold onto them? Or is there more to it? Is this generation shaking up the very foundations that might actually need some shaking up? 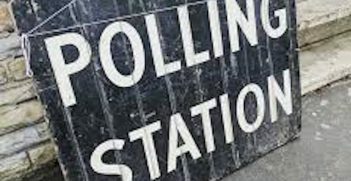 It seems to me that many generations have fought for change, and so it’s not a new phenomenon to want to do better: the end of slavery, women’s right to vote and the end of Apartheid, to drop just a few examples. Young people seem to love social change. But this generation could be dealing with it on a scale unlike ever before, thanks to our handy little devices that we carry with us everywhere. You might be interested to know that according to research conducted by the Pew Research Center and the University of Sydney, the majority of Millennials really dislike being labelled a Millennial. In fact, they hate it – ain’t nobody got time to be put in a box with a label. This is in stark contrast to the Baby Boomers who can’t get enough of it. For them, it’s a label to be proud of. They got amongst it and shook the foundations before them and want to tell everyone about this rad group they are in. I spend a lot of time talking to and engaging with Millennials, and I’ve deliberately used ‘Millennial speak’ here. Confusing, huh? You guessed it; I am a Millennial too… but I think I’m proud of it! At Global Citizen, we have fully embraced this new world and everything technology has to offer. We are harnessing its power towards ending extreme poverty. We write about development and international affairs because this generation is interested in it. You could say talking to a Millennial audience is our bread and butter, and we don’t shy away from that. We know the truth, and it’s pretty exciting. Now, this is someone who knows a thing or two about changing the world. This year we have seen how combining the heart and experience of someone like Nelson Mandela, with the passion and energy to change the world from the current generation, is powerful. 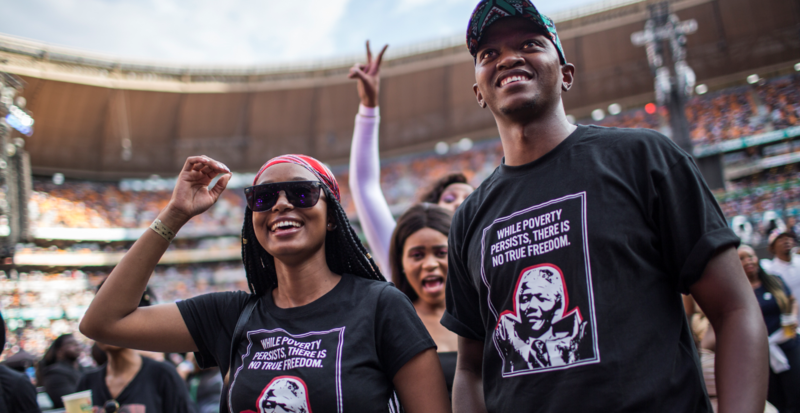 On 2 December, Global Citizen held our first festival in South Africa, in partnership with the House of Mandela and the Motsepe Foundation, to honour the life and legacy of Nelson Mandela in what would have been his hundredth year. In front of 75,000 people at the FNB stadium in Johannesburg, world leaders and corporates made 58 commitments, worth more than $7 billion, towards ending extreme poverty that are set to affect the lives of 137 million people. These commitments are life-changing and include funding for neglected tropical diseases, water and sanitation, food and nutrition, the environment, education and empowering girls and women. More than 5 million actions were taken by global citizens, mostly young people and in Africa, in the lead up to Global Citizen Festival Mandela 100 to secure these commitments. That’s five million tweets, emails or petition signatures calling for action towards eradicating poverty in our lifetime. And we will be holding all those that made commitments accountable. Our world leaders have set the roadmap for eradicating extreme poverty, the United Nations Sustainable Development Goals, of which Australia is a signatory. Simply pledging to see the delivery of the SDGs is not enough. It requires practical steps from us all, but particularly our governments. This includes investing in critical programs through foreign aid, ensuring countries have good governance, that funding is directed where it is needed most and prioritising legal reforms that level the law for women and girls. Millennials are doing this every day, and if our leaders listen and step up, we may just be the generation that sees an end to extreme poverty. Now I think that deserves a #YASS. Sarah Meredith is the Australian Country Director at Global Citizen. 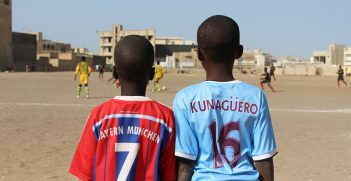 The World Cup final drew millions of enthusiastic viewers around the world, including young men in impoverished regions who dream of sporting success as the only way to escape poverty. 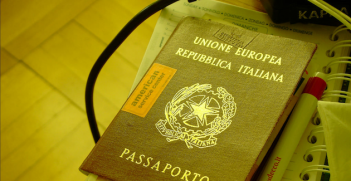 It's a dual citizenship crisis, but a long way from Canberra. As Sierra Leone prepares for elections on 7 March, the West African country is battling over what defines a citizen and who can run for government.